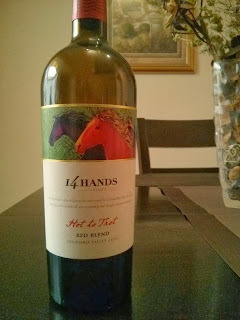 14 Hands 2010's Hot to Trot is a blended red wine of Merlot, Syrah and Cabernet Sauvignon. It has a relatively high alcohol smell with long and skinny wine tears (Alc 13.5%). It is a very dark ruby red color. Taste is something more akin to ripe cherry, fruit and plumb. There could be some clove in there somewhere. The aftertaste was medium with a little tannin tang making it smooth. In 2012, the wine was named Leader’s Choice Wine’s of the Year by Market Watch. The wine is one of the fourth largest growth wines in the country. Originally, it was introduced in 2005 as a by-the-glass restaurant beverage. Once customers got a taste of the ripe fruit, the company began to market it by the bottle. I have tried this wine and was surprised by its quality and price. It is definitely ranking high compared to other wines in the pricing category. This is a great addition to your “for use” selection for around $10. You may want to see the wine pricing changes at Wine-Searcher.